Outdoor facilities designed to be enjoyed by mountain bikers, joggers, cyclists or casual walk with family and friends. Doha, 14 March 2017: Doha Festival City (DHFC) has revealed a glimpse of some of the additional activities that will be available at Qatar’s largest entertainment, retail and dining destination, with images of its 3km Outdoor Leisure Trail which surrounds the project. Upon its opening in April, visitors will have free access to the Outdoor Leisure Trail, which includes a running and walking path, as well as an adjacent Cycling Lane with technical trail features specifically designed for mountain bikes. 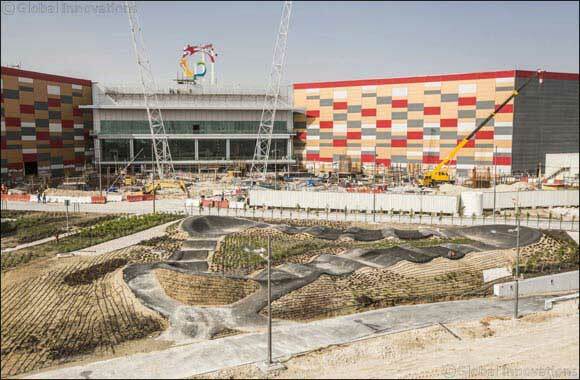 The Outdoor Leisure Trail which surrounds Doha Festival City, caters for both running and cycling, and is designed with fun and fitness in mind. The mountain bike cycle track has a number of different route features and offers various surfaces with inbuilt gradients and obstacles to suit all abilities of mountain bikers and was designed by British company, Architrail. The running track also has exercise stations along the route, allowing both casual and more serious runners to exercise and enjoy the green spaces being created as part of the project. The Mountain Bike Trail consists of 13 different Technical Trail Features (TTF) suitable for beginners and more advanced cyclists wishing to improve their mountain bike skills, with each TTF designed to simulate challenges one would encounter on a Mountain Bike Trail. Features include Grade Reversals, Berms, a Pump Track, Wedges, a Rock Causeway, Drop Offs, Rock Gardens, Water Causeway, EcoPlastic boardwalk, Mist Tunnel, Rollers & Jerms, Rock Climbing, and a wrap up section to put all skills to the test.